“It is a common human experience that you are repulsed by an ugly human, animal, bird or tree. On the contrary, you are attracted by a beautiful bird and beautiful tree. Outer beauty or ugliness is certainly a reflection of the inner. A beautiful person created an inner beauty in a past life, which is responsible for their current outward features. Likewise, the ugly person created an inner ugliness. The bottom line is if you are ugly you should try to correct it. You can do it in many ways. I am happy to write this note during spring time. We all do a spring cleaning of the house, cars, etc. We also have to do spring cleaning for the inner as well. The Siddha Masters revealed divine secrets to clean up the inner, particularly the inner that becomes responsible for your outer imperfections. There is a mythological incarnation of the God Vishnu as a lion man. The lion man called Narasimha. A lion man is not a beautiful form, it is quite repulsive. Vishnu innately is a very handsome God. Remember he is Krishna, the charmer. He charms all girls and dances with them. However, the same Vishnu assumed the ugly form in order to help humanity. Keep worshiping Narasimha. 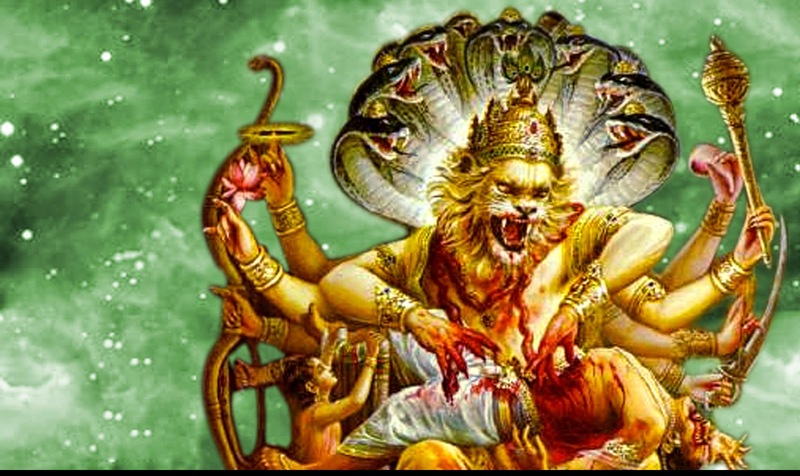 On Saturday, May 2nd 2015 (IST), a fierce archetypal energy in the form of a Lion-Man God, known as Narasimha becomes available. Narasimha is specially noted for clearing evil eye, negative spirits and bad energy from the environment. If you are subject to other’s jealousy, hatred and enmity, then Lord Narasimha will bring special relief to you. Invoke His protection from malicious acts of others and to recover all your lost assets and also be blessed with abundant prosperity. Problems related to real estate and career will be resolved. In addition, it is possible to attain a good physique, with the blessings of Narasimha. Narasimha is one of the greatest avatars of Lord Vishnu. Jayanti, means observing a birthday. Narasimha Jayanti is celebrated to observe the day that Vishnu took the form of the Man-Lion to save the world from the super demon. Astrologically, the planets that signify the Narasimha Avatar of Vishnu are Mercury and Mars. Lord Vishnu is the overlord of the planet Mercury and Mars indicates ferociousness. Narasimha stands for destroying any form of evil whatsoever be its origin. On this day, the Moon will be in the sign of Virgo ruled by Mercury and in the star of Chitra owned by Mars. Therefore, both Mars and Mercury are prominent on Narasimha Jayanti. The Siddhas advise that we remain prayerful during Narasimha Jayanti. This will help to reduce the ego and expand your capacity to love. When depicted with his consort Lakshmi, they represent the calm after the storm, making way for blessings of prosperity, love and happiness. The 6th Moon on Friday, April 24th (IST), is a day that will be filled with the energy of Mars and the Pleiadian Archetype, Lord Muruga. Astrologically, the Moon will be in the sign of Gemini and in the star of Punarvasu. The 6th waxing Moon is for Lord Muruga. Muruga is the overlord for the planet Mars and Mars will be in its own sign Aries which is the 11th house to the Moon on this day. Jupiter will be in the 2nd house to the Moon. This is very auspicious for wealth because the 2nd house to the Moon has powerful exalted Jupiter and the 11th house to the Moon has powerful Mars. Therefore, this is a good combination to have the blessings of Lord Muruga for prosperity. Muruga is associated with the number 6 (6th Waxing Moon), and has the ability to bring relief to you for the 6th house matters. Specifically his 6 syllable mantra (see below) will vanquish enemies, ensure success in legal tangles, provide relief from debts and bestow good health. Propitiating Muruga and Mars on this day will infuse you with power and confidence. In addition, participating in the 6th waxing Moon rituals will help remove negative effects of a weak or afflicted Mars, as Muruga is the ruler of Mars. Spiritually, the Moon is responsible for your receptivity to Light as well as your ability to connect with the Mother Goddess. Muruga has a special connection with the number 6. He has 6 heads and is worshiped with the 6 letter mantra: “Sa Ra Va Na Ba Va”. Each of the 6 syllables is dedicated to the 6 faces of Lord Muruga. Repeat this Mantra 108 times (or more) to instill deep within yourself these traits of Muruga. If Mars is placed in the 1st, 4th, 7th, 8th or the 12th house of your Horoscope, then you have a Mars Affliction (known as Manglik). Meaning Mars will cause problems in relationships and how you relate to life in general, especially in the first 30 years of life. However, Mars is a planet that learns from his mistakes, so maturity will bring hard-earned wisdom. Muruga’s Vel represents infinite wisdom that brings true liberation. It destroys karma that has accumulated over many lifetimes. The Vel Shakti allows you to think and act with power, and end ignorance by dissolving karmic impressions. Muruga’s birth star is Krittika, which is also the Sanskrit name for the Pleiades star cluster.